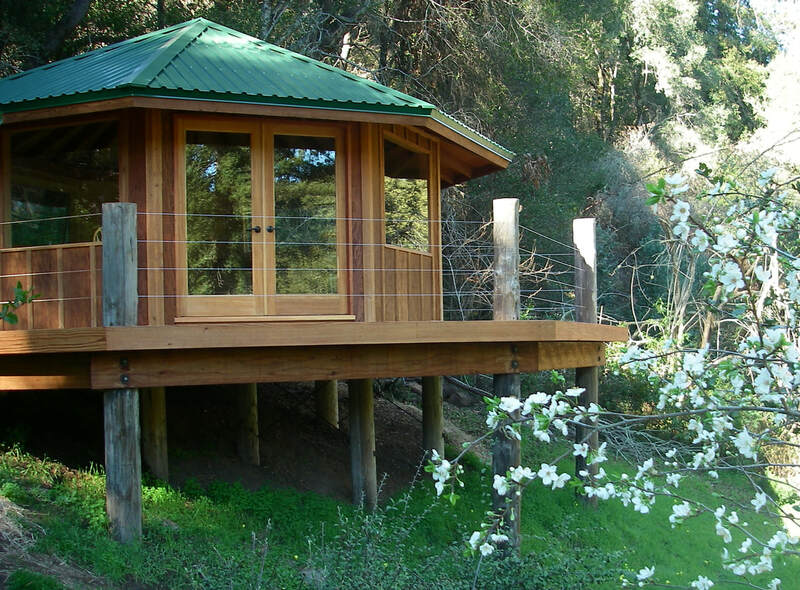 The Eagle’s Nest, in the Santa Cruz Mountains of California, was built to provide a simple vacation cabin for a nature conservationist who lives and works in South Africa. Its rounded shape, large windows and use of environmentally friendly building materials express an essential appreciation and love of nature. The goal of the project was to create a small house that would allow the occupant to feel, see, and hear the surrounding natural environment. The cabin features a salvaged pole foundation, century-old reclaimed wood flooring, sustainably harvested pine and local redwood, recycled cotton insulation, natural oil finishes, and recycled windows, cabinets, and header beams. The site remained relatively undisturbed during construction due to the pole foundation, and materials being carried in by hand. Architectural inspiration for the design was found in the California redwood barn, the fire lookout towers of the Pacific Northwest, and the traditional Zen sensibility of wabi sabi. This small house project was intended to encourage simple living in tune with the natural world. Recognizing that we are truly embedded in nature, rather than in human infrastructure, may be key to our overall well-being, and to the well-being of all life on planet Earth. The world is not a rectangle. Live outside... the box.